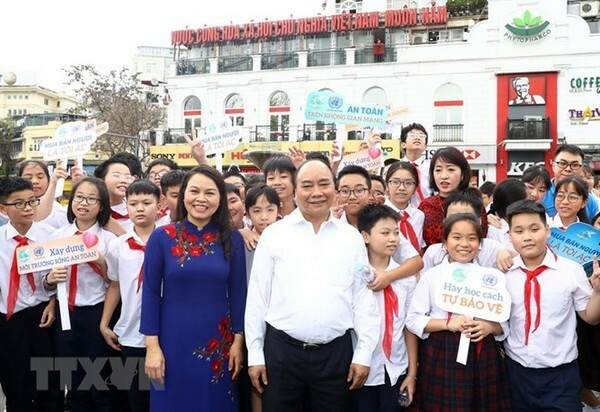 Prime Minister Nguyen Xuan Phuc has affirmed the Vietnamese Party and State’s consistent policy of ensuring rights of people, including women and children. He made the statement during a teleconference held by the Vietnam Women’s Union (VWU)’s Central Committee in Hanoi and Ho Chi Minh City on March 6 to launch “The Safety Year for Women and Children”, contributing to the national action plan for the United Nations (UN) Agenda for Sustainable Development 2030. The PM said legal regulations on gender equality, domestic violence prevention, health care, education, rights protection, and women empowerment have been refined. The State has provided free health insurance for children aged below 6 while nearly all children benefited from the expanded vaccination programme, nearly all those aged 5 attended preschools, and about 90 percent of children living in difficulties enjoyed social support. He lauded the VWU for raising public awareness of gender equality and the importance of ensuring safety for women and children in the fulfillment of sustainable development goals. Ministries, agencies, mass organisations and localities were asked to review action plans, propose regulations and policies on social safety and welfare for children and women, seriously punish violations affecting their lives, health and dignity. VWU Central Committee Chairwoman Nguyen Thi Thu Ha said 61 women and seven children suffered domestic violence and three children were victims of sexual abuse each day during 2012-2015. UN Resident Coordinator in Vietnam Kamal Malhotra said discrimination and violence against women and children, especially girls, are the most popular violation of human rights in the world, which is also the least prosecuted crime. This year, the VWU Central Committee will take specific actions at the local and central levels such as holding communication campaigns on safety for women and children on television and radio stations, issuing publications, organising conferences and dialogues with ministries, agencies and localities, reviewing and proposing legal regulations, holding capacity training for female officers and those involved in the work.